(Nanowerk News) How do you teach robotic insects to see? By equipping them with tiny laser-powered sensors that act as eyes, enabling the miniature machines to sense the size, shape and distance of approaching objects. The UB-led research project, funded by a $1.1 million National Science Foundation grant, includes researchers from Harvard University and the University of Florida. It is an offshoot of the RoboBee initiative, led by Harvard and Northeastern University, which aims to create insect-inspired robots that someday may be used in agriculture and disaster relief. Researchers have shown that robot bees are capable of tethered flight and moving while submerged in water. One of their limitations, however, is a lack of depth perception. For example, a robot bee cannot sense what’s in front of it. This is problematic if you want the bee to avoid flying into a wall or have it land in a flower, says Dantu, who worked on the RoboBee project as a postdoctoral researcher at Harvard before joining UB’s School of Engineering and Applied Sciences in 2013 as an assistant professor. The UB-led research team will address the limitation by outfitting the robot bee with remote sensing technology called lidar, the same laser-based sensor system that is making driverless cars possible. Lidar (short for light detection and ranging) works like radar, only it emits invisible laser beams instead of microwaves. The beams capture light reflected from distant objects. Sensors then measure the time it takes the light to return to calculate the distance and shape of the objects. The information is then analyzed by computer algorithms to form a coherent image of the car’s path. This enables the car to “see” its environment and follow traffic signs, avoid obstacles and make other adjustments. University of Florida researchers will develop the tiny sensor that measures the light’s reflection, while Dantu will create novel perception and navigation algorithms that enable the bee to process and map the world around it. Harvard researchers will then incorporate the technology into the bees. 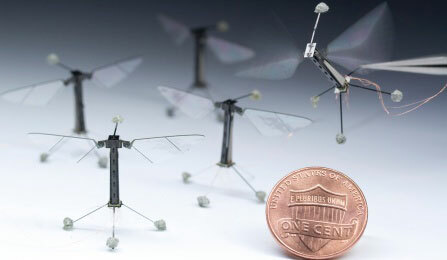 The technology the team develops likely won’t be limited to robot insects. The sensors could be used, among other things, in wearable technology; endoscopic tools; and smartphones, tablets and other mobile devices.